Photo by India Green Building Council (IGBC). 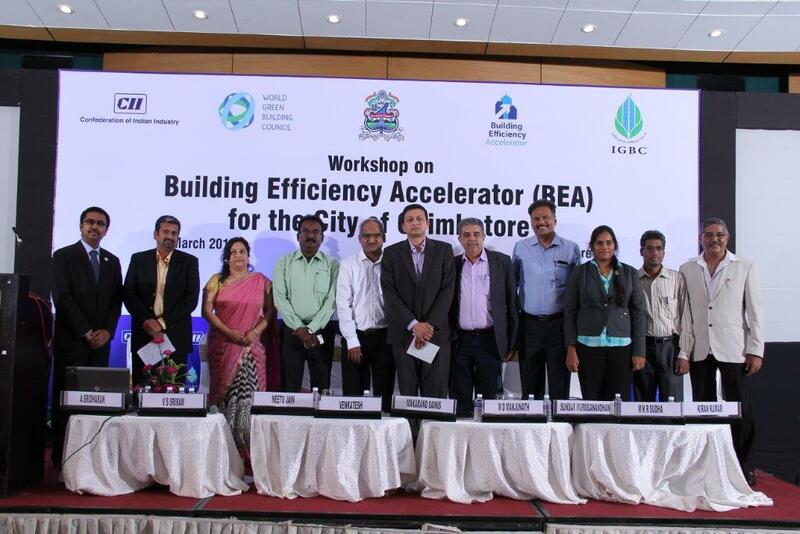 In early March 2017, over 70 government, non-profit, and private sector stakeholders gathered at a Building Efficiency Accelerator workshop in Coimbatore, India, organized by the Indian Green Building Council (IGBC) with support from WRI and ICLEI. At the workshop, stakeholders discussed plans for Coimbatore’s BEA actions. IGBC, in partnership with the Coimbatore City Municipal Corporation and the Confederation of Indian Industries, have launched an initiative to reduce energy consumption in the city by one megawatt (MW) over the next five months. While one MW is modest compared to the city’s overall energy demand, it is part of an overarching awareness-raising campaign to teach individuals how to adopt energy efficiency measures in buildings, from purchasing BEE Star-rated appliances to replacing old, inefficient light fixtures with LED lights. The Tamil Nadu Generation and Distribution Corporation (Tangedco) will be one of the many government, educational, and industrial facilities that will take part in reducing their energy consumption as part of the initiative. Read more about the event on The Hindu and The Economic Times Energyworld.